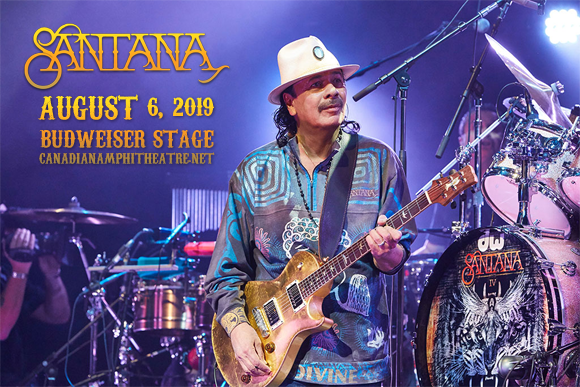 A band that needs absolutely no introduction: Santana comes to Budweiser Stage on Tuesday 6th August 2019! The group will perform a mixture of beloved hits and brand new material as part of their Supernatural Now Tour, which celebrates 50 years since they appeared at Woodstock, 20 years since the release of their crucial album Supernatural, and the release of their 25th studio album this summer! They will be joined in support by none other than The Doobie Brothers! “We’re always moving forward, and we have incredible new songs and melodies that will inspire you,” Carlos Santana said in a press release. Latin rock band Santana was formed by Mexican-American Carlos Santana in 1967, in San Francisco, California. The group came to prominence with a noted performance at Woodstock in 1969, and they released their self-titled debut album with Columbia later that year. In the five decades since the band's inception, all bar seven of their 24 studio albums have been certified Gold, Platinum or Multi-Platinum by the RIAA. Supernatural, the group's most successful studio album and their first with Artista, reached number one in several countries, earned 15-times platinum certification and sold nearly 27 million copies worldwide. As of 2010, the group has sold over 100 million albums worldwide and has won ten Grammy Awards and three Latin Grammy Awards. The band has had four albums that reached number one in the Billboard charts (Abraxas, Santana III, Supernatural, Shaman), along with two number one singles ("Smooth", "Maria Maria"). Santana was inducted into the Rock and Roll Hall of Fame in 1998.